Critics charge that ICE is out of control under President Trump. Has the federal agency always been so controversial? For most of the 20th century, a single federal agency, the Immigration and Naturalization Service, was responsible for both legal immigration and enforcement against illegal immigration. Deporting undocumented immigrants was part of the agency’s job‚ but only a small one. The 9/11 attacks, carried out by terrorists who entered the country legally, led many politicians to argue that INS wasn’t up to the task and that immigration rules needed to be more strictly enforced. So in 2003, the federal immigration bureaucracy was integrated into the new Department of Homeland Security and split into three agencies. Legal immigration would be handled by the U.S. Citizenship and Immigration Services, border enforcement by Customs and Border Protection, and the enforcement of immigration law inside the U.S. by Immigration and Customs Enforcement (ICE). The agency set as its goal a “100 percent rate of removal for all removable aliens”—a category that encompasses more than 11 million people, including those who have crossed the border illegally or overstayed their visa, and lawful resident immigrants who have committed a felony. Yes. Under President George W. Bush, the number of undocumented immigrants apprehended inside the U.S. surged from 115,000 in 1998 to 320,000 in 2008. That year, nearly two-thirds of the 369,000 aliens deported had been caught inside the U.S. ICE was able to boost those numbers by cooperating more with local law enforcement—which began passing custody of jailed undocumented immigrants to the agency—and cranking up raids on homes and workplaces. Arrests of workers solely for being in the country illegally went from 445 in 2003 to 3,667 in 2006. “Gone are the days where individuals will find a haven here,” ICE spokesman Greg Palmore said in 2007. 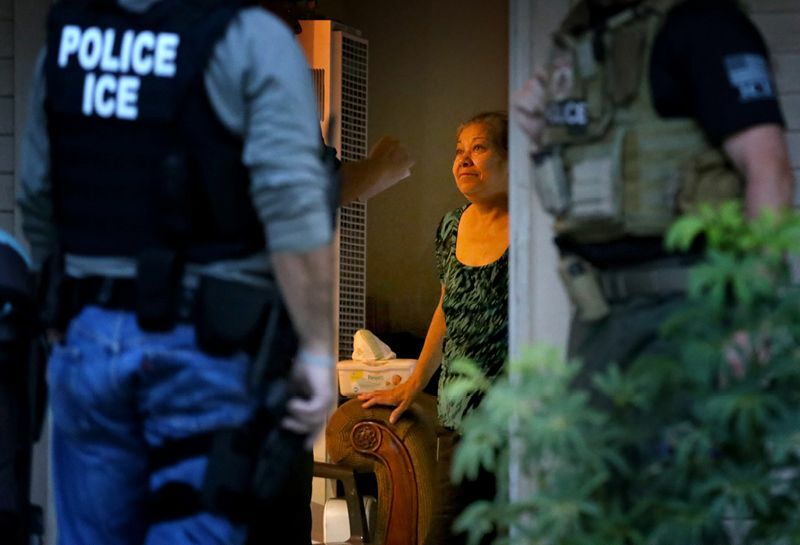 The crackdown continued under President Barack Obama, nicknamed Deporter in Chief by critics, with ICE arrests peaking at more than 300,000 annually in 2010 and 2011 and deportations from the U.S. interior topping 200,000 in both years. Those numbers dropped after Obama ordered ICE in 2014 to focus on serious criminals. Still, the agency continued to expand. As of 2016, it had a budget of $6.1 billion—nearly double its 2003 level—and some 8,000 agents. Trump came into office promising a “zero tolerance” immigration regime. “If you’re in this country illegally,” ICE acting director Thomas Homan said in 2017, “you should look over your shoulder.” Yet during Trump’s first year in office, ICE arrested only 143,000 people and removed just over 61,000, far fewer than in Obama’s peak years. The Migration Policy Institute says the agency has been thwarted by states and cities that have adopted “sanctuary” policies, which limit cooperation between authorities and immigration enforcement. Yet activists say that undocumented immigrants’ fear of ICE has increased under Trump because the agency has become much less discriminating in its targets. Arrests of undocumented immigrants with no criminal record tripled in Trump’s first 14 months, to 58,010, compared with Obama’s last 14 months. Over the same period, arrests of undocumented immigrants with criminal records climbed only 18 percent. How does ICE find undocumented immigrants? What happens after a raid?